Background: Children have always delighted in playing in the sand, bringing their inner and outer worlds together through imagination. Different cultures have also used sand in imaginal rituals of visioning. The Dogon medicine men of Mali draw patterns in the sand and later read the paw prints left in the night by the desert fox to divine the future. Tibetan Buddhist monks spend weeks creating the Kalachakra sand mandala which is used for contemplation and initiation into Tantric practices. The analyst Donald Sandner, in Navaho Symbols of Healing, wrote about the Navaho sand painting ceremonies in which images of world order are created to invoke the healing powers that bring the psyche of the people back into harmony with the universe. Upon the completion of all these rituals the sand is brushed away and dispersed. Dora Kalff, the Swiss analyst and creator of this technique of active imagination, was initially influenced and encouraged by Emma and Carl Jung, as well as her immersion in Tibetan Buddhism. Sandplay therapists working in Kalff’s method differentiate ‘sandplay’ from sandtray therapy. 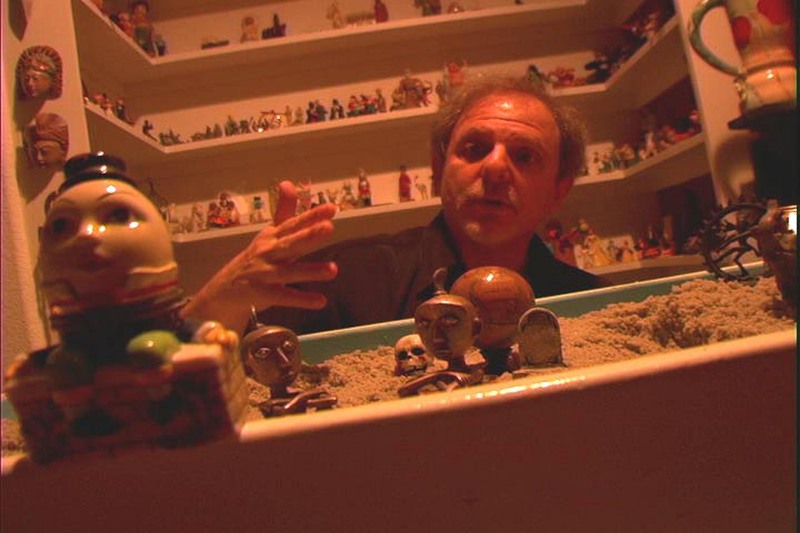 Sandtray therapy is a more generic term referring to a variety of effective ways of using sand, figures, and a container from different theoretical perspectives. Sandplay therapy emphasizes the spontaneous and dynamic qualities of the creative experience itself. Its essence is non-verbal and symbolic. 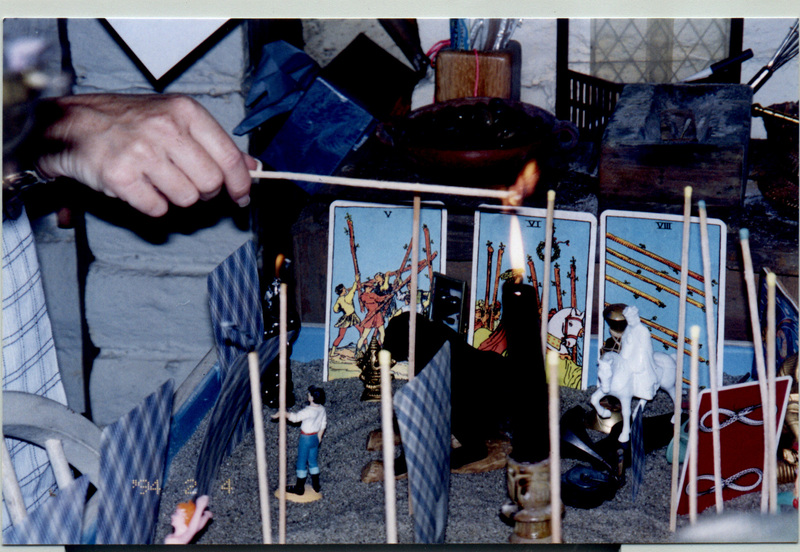 In what Kalff called the “free and protected place” provided by the tray and the relationship with the therapist, the client plays with sand, water, and miniatures over a period of time, constructing concrete manifestations of his inner world. My own therapy work with sandplay is almost exclusively with adults and teens. Occasionally during talk therapy something arises in a person’s process for which the non-verbal, intuitive AND tactile, sandplay experience calls out for. This is usually when words fail to get at the heart of the true experience a person is wrestling with, and something raw and visceral is needed. Personally, I undertook in a year-long course of sandplay with a therapist in San Diego (some twenty years ago) all in preparation for my first journey to N. India on a spiritual retreat. For me, it was mostly about relationships and “inner child work” but via 3D, dream-like, miniature objects in a sandbox constructing my deep inner rumblings synchronistically and creatively, truly a remarkable healing experience for me! When energies in the form of “living symbols” are touched upon in the personal and collective unconscious, healing can happen spontaneously within a person at an unconscious level. Very little rational analysis of a sandscape is necessary. As a more harmonious relationship between the conscious and the unconscious develops, the ego is quietly though palpably restructured and strengthened. One feels the effects of at the core of one’s being. The quiet tray with its smooth sand, and a trusted therapist nearby supporting and protecting the purity of the space, allows images to arrive for the maker. The variety of figures and the sensory experience of sand and water also stimulate the unconscious. The elemental nature of sandplay evokes the body and touches the mother within. Sand can be molded, water poured, fire ignited, and air blown. The elemental flow and balance that is created in the tray mirrors processes in the psyche as well as in the natural world. In other words, the matrix of all possibility in manifest form. 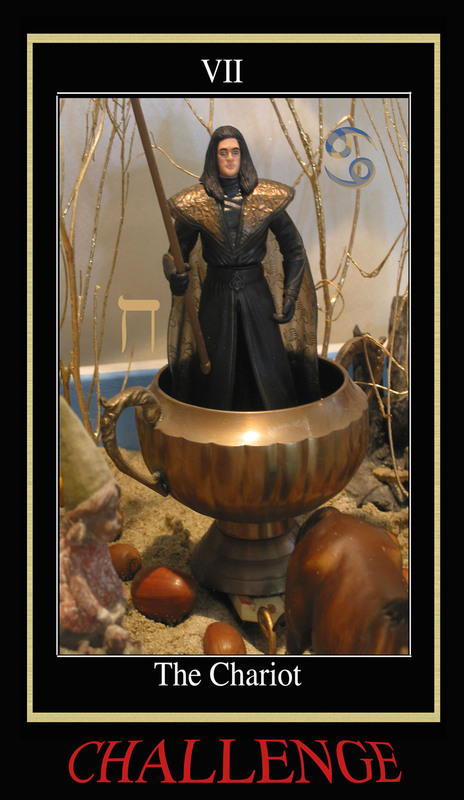 Another guideline for sandplay collectors is to allow yourself to be “chosen” by your collection. This is the same process we ask of our clients, so it is a good practice for us as well. You may be surprised by what figures want to be in your collection. My own collection includes objects from my travels through India, Egypt, Mexico, Hawaii, California, the East Coast etc. 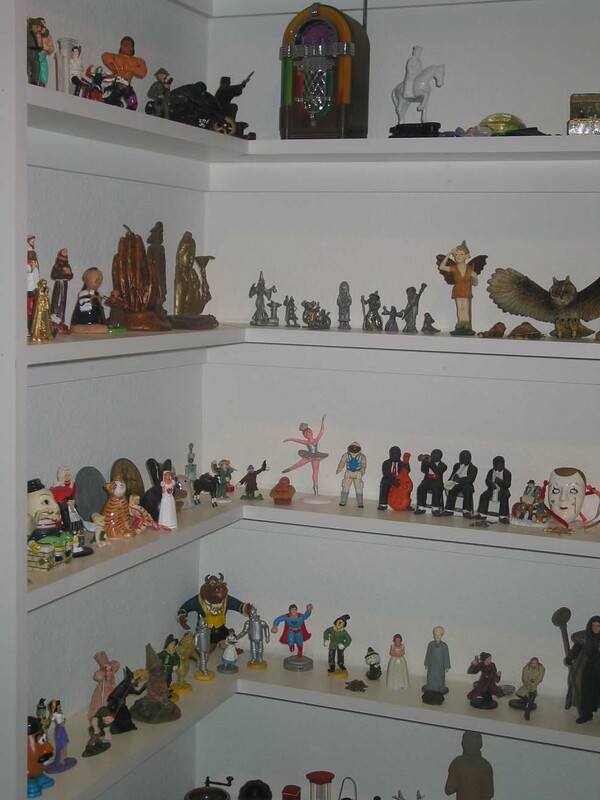 and local second hand stores, relative’s attics, flea markets, toy stores, antique & collectibles stores, garage sales, kid’s stuff, street fairs, the garage, hiking in the woods or on the beach, as well as special internet and curio stores that specialize in sandplay miniatures. 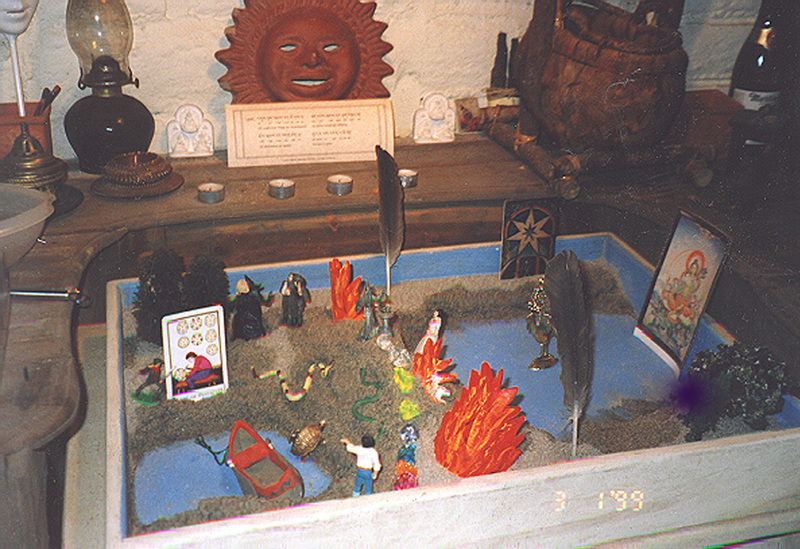 I have managed to effectively utilize sandplay objects, including the shelves, objects, and sandbox itself during magical rituals in private classes and small group settings in my home office (below); rather remarkably, sandplay invokes the living, breathing, magical quality of “religious practice” but in a very earthy, playful, FUN, and creative way. As Kalff emphasized, the process “relativizes the ego” and activates the healing energy of spontaneous play–rather common ground for small children, but a rare treasure for over-enculturated adults. 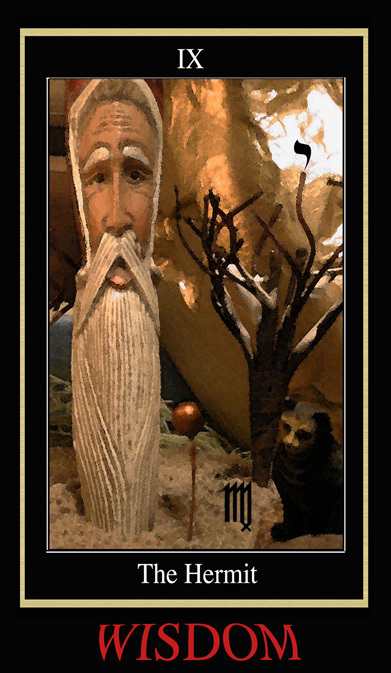 Please contact me if you’d like to learn more about this wonderful technique and process, or to order TNP–Tarot Of The Nine Paths–the tarot deck I created out of sandplay scenes in my own office.